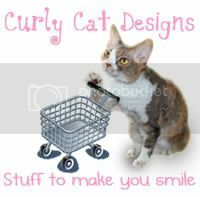 Daisy the Curly Cat: I Was DQ'd! Can you tell I am READY?!?! This is my most PROFESSIONAL and SERIOUS expression. And my ARMS are all WARMED up and READY to SCOOP! OH, I almost FORGOT my VISOR! I would NOT want to get any HAIRS in your ICE CREAM! I think the VISOR is more MANLY than a HAIRNET. I am HARLEY in the HOOD! Ooops. That might NOT have been too PROFESSIONAL. HOW MANY scoops did you say you wanted??!!?! Ps: Can you see the fancy DAISY picture in the upper right?!!? I would like a Dilly Bar, Harley. Does DQ still have those? You look really cute in your new work outfit! Can you make me a Peanut Buster Parfait? Love those! Looking good! Harley, if you worked at my DQ (that is, if DQ existed here lol) i would visit you every day!! I would like two skoops of chocolate chip cookie dough ice cream, with hot fudge and sprinkles, please. Be careful with the sprinkles, though, because they get everywhere. You look adorable in your DQ uniform, especially your visor. I love your eyes, Harley. You make me swoon. Nice, umm, DQ outfit! 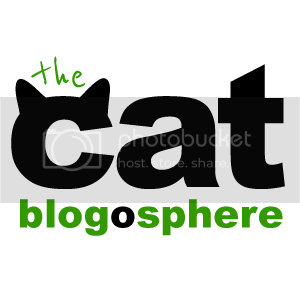 Thanks for pointing me in the direction of that blogoshere thing. I'm new to this, and was wondering how to get more exposure. Oh Harley, you are the best. Love the visor. Has anyone told you lately that you have the most wonderful eyes?? We would like three scoops of chocolate please. Have yourselves a terrific Friday. Harley.... I want one of those blizzards, preferably mouse flavored. Three scoops for me please Harley! 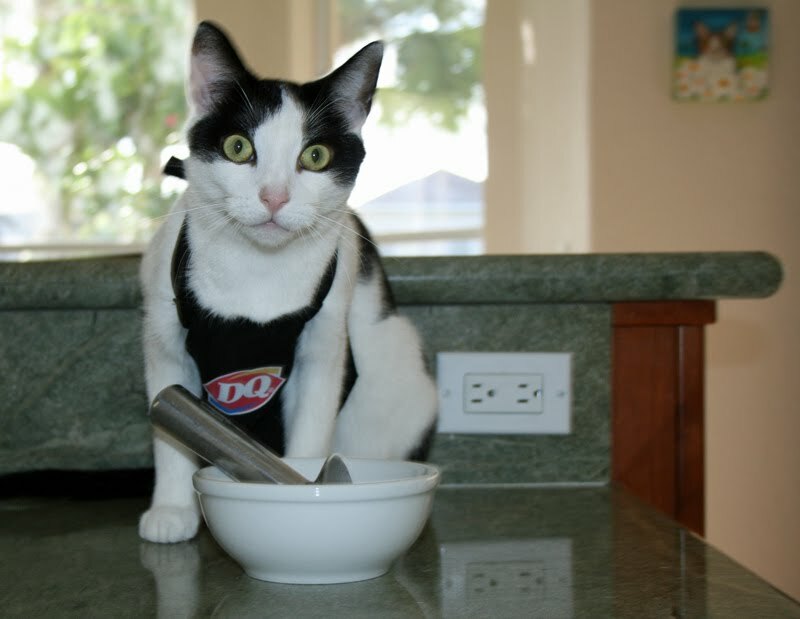 We would be very happy to have you serve our ice cream, Harley! 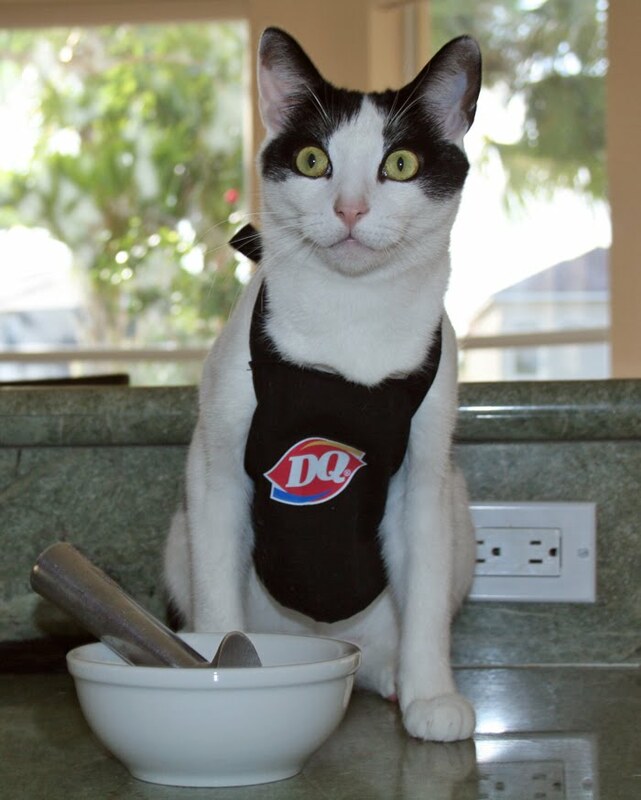 i'll have a tuna blizzard please. 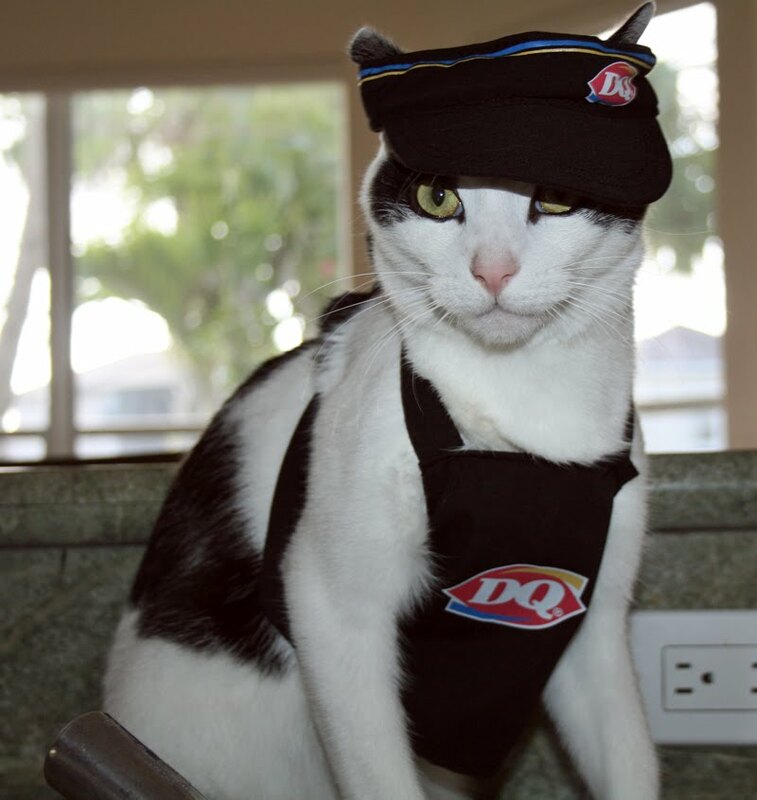 You really look like a DQ professional!!! We'll have a Chocolete Xtreme Blizzard please!! Ill have a scoop of coffee ice cream!.. what.. what do you mean I cant have any, mom? Boo..
We barely see the daisy pic! Maybe a close up later? You look very professional in your visor Harley - can we have 2 strawberry cones please. OMC - we love ice cream. Mom actually got a blizzard last night on her way home, but no matter how much tommy begged, she wouldn't share (something about chocolate). So, could we have some vanilla please??? I'll bet the chicks are lining up at the DQ with you working there!! I like the visor--very hip-hop. What a great job! I bet you'll get lots of green papers for doing it. And the visor is very manly. Some of the best photos I've seen of you! Such big eyes you have! Harley, you are just so cute! 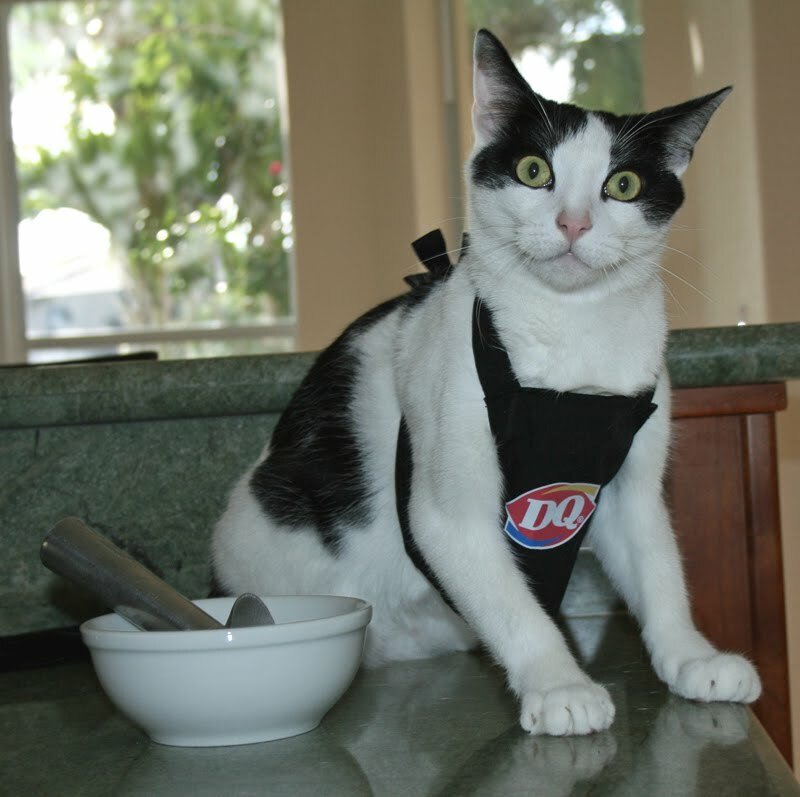 That's very exciting that you got a job at DQ! Our mommy's first job was at DQ but she got fired after the first day because she couldn't make the curly Q on top of the cones. Plus she filled all available freezer space with take home containers of ice cream from her many, many attempts at making that Q! MOL! Those are great pictures of Harley and his DQ outfit! How cool that you have that great outfit! And such a professional. I saw Daisy's picture in the back--I know it cause we have one of all of us! I will take two scoops of apple and grain ice cream please. Harley, does DQ make salmon ice cream? We will take a regular old vanilla ice cream cone!!! We do see the picture of Daisy!!! Meowm still hasn't figured out the purrfect spot to hang ours! Three scoops of banilla, in dishes, please. Sadie keeps saying Harley and ice cream, mmm mmm. I see you're kind of backed up with orders, Harley, but that's OK, we'll wait. Um...let's see...Mom will have a french silk blizzard and Dad will have a strawberry blizzard. Misty & Tipper want white in a cup with tuna sprinkles and Max and I will have a chocolate cup with mousie sprinkles, please! You are a ver photogenic feline. I wish my cat were as handsome as you. But he's just a drawing. Harley I have never ever seen you looking better! That iz THE uniform for you. And the visor is perfection on you. All the lady cats will be all fainty after they see you. And your arms are so strong looking!!! I love that outfit, Daisy. You did well to keep the hat on long enough for the photo to be taken. Mmmm, ice cream is yummy in the tummy. 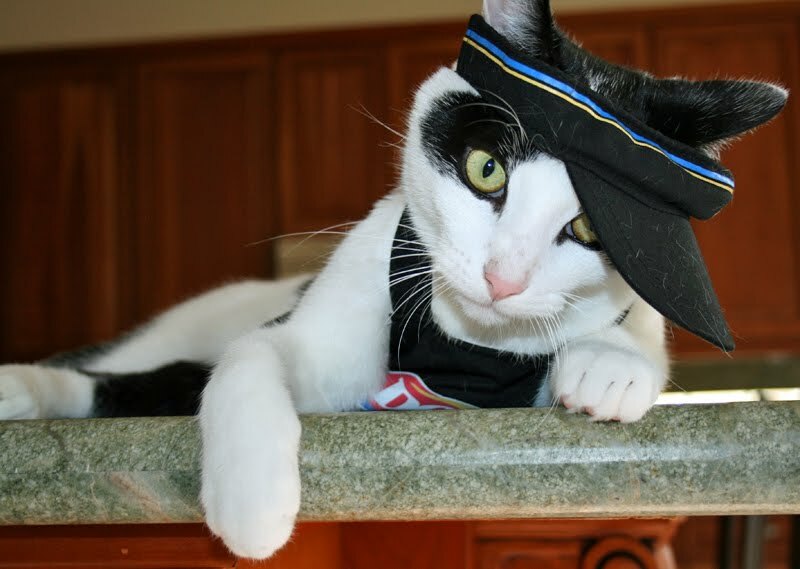 You look very mancatly in your uniform Harley, and we agree, a visor is much better than a hairnet for you. Mom will take two scoops. Have you learned how to do the DQ curl, yet! We scream, you scream, we all scream for ice cream!! Serve it up, Harley!! Harley - I'd like a medium dipped cone. Please be careful not to get your paws in the hot chocolotate. Ouch! Harley, you look like a good scooper. I'm starting a DQ petition. Salmon Dilly Bars. Shaped like little pink salmons. On a stick. Are you in? I'd buy ice-cream from you any-day. Harley, you could serve me icecream anytime in that outfit! Harley, we would buy ice cream from you anytime! Happy Caturday! Harley! We will take all the scoops we can get of you! Gosh you are such a cutie! Own!!! Harley, I´m realy in love about you! Harley, that is the coolest! We LOVE DQ! We're at the end of the line, but we'll wait patiently for Harley. We are relieved that you were not DQ'd from DQ! I'll take one Peanut Buster Parfait please! Extra fudge and extra nuts!!! Yum! Yep I see the Daisy photo too! We would order ice cream from you annytime, Harley! Does you have anny "Minty Mouse" flavor? Can you send me your email so that I can send you the captioned photos I do of Harley or Daisy when they inspire me. I just would feel better to have your approval. We don't think we'd be very good ice cream servers cuz we'd want to taste every scoop! 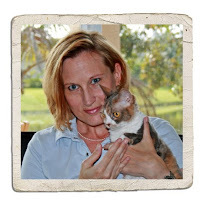 Yes, is that Daisy Picture from Daisy's boycatfriend Skeezix? It reminds us of the art his FL does! This Dairy Queen Look goes perfectly with Daisy's (red hat) Annie Oakley look! Ha!